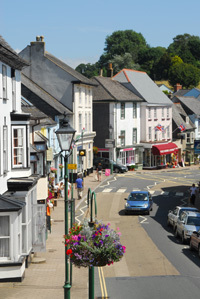 Modbury, population 1,700, is a small country town in the South Hams district of Devon, rich in history and character. It lies midway between Dartmoor National Park and the some of the most unspoilt beaches on the South Devon coast. Plymouth is 12 miles to the west. The history of Modbury has been researched in depth by the Local History Society and Unique Heritage of Modbury website has a wealth of information and pictures. 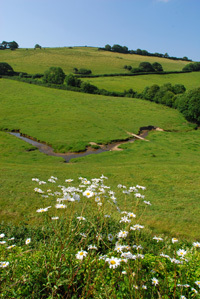 Modbury is unique within the South Hams, having all the amenities of a small town yet retaining the community spirit of a village. While its rural setting, conservation areas and undoubted historic charm make it very appealing, it is the welcoming spirit and sense of community, shown by the people of Modbury, that makes the town such a desirable place to enjoy family life. The town is also a centre for people from the outlying farms and villages who make good use of the fine selection of local shops and services as well as the pubs and cafés. The primary school and church are well supported as are numerous functions and activities, many of which take place in the town’s two public meeting halls. A sports and recreation centre provides many opportunities for keeping fit while playgrounds provide safe opportunities for younger children to work off some excess energy. The annual May Fair and the switching on of the Christmas Lights are two highlights of the Modbury year when most of the town turn out. When it comes to quality of life, Modbury is happy to lead the way.